Check out the Latest on the Social Ape Marketing Blog! 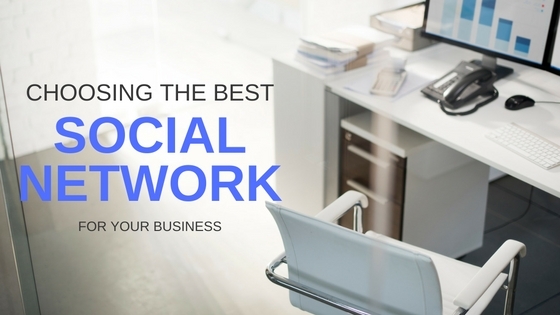 Read the Social Ape Marketing blog for the latest marketing and social media tips. It's a question we all ask ourselves. No matter if you're an expert, newbie, or just a casual user: When and where should I post on social media for the most engagement? 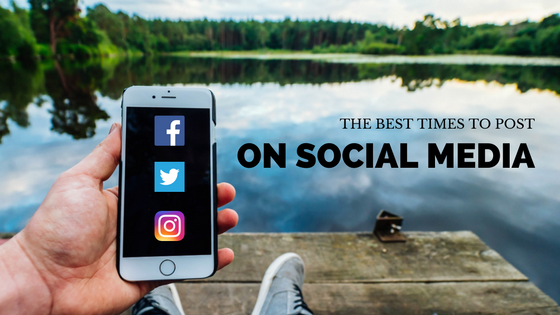 The best times to post vary by industry, social media channels, and your audience. There's no magic number but, knowing your target audience and how they use social media are key components for a successful campaign. Recently, TrackMaven, a marketing analytics software provider analyzed 17.5 million social media posts by 17,737 brands to find the most popular times to deploy your content. It's important for a business to develop a channel-specific strategy for delivering their content.The report also breaks down popular post times by day for various types of businesses on Twitter, Facebook, LinkedIn, Instagram, and Pinterest. From fashion to restaurants, these are the best times to reach the most engagement within a few industries. You can view the rest of TrackMaven's cheat sheet here. Notice that even within industries, the best times to post vary by social channel. For example, the best time to tweet for a restaurant is Friday at 1 p.m. EST but, on Instagram the best time to post is Wednesday at 4 p.m. EST. 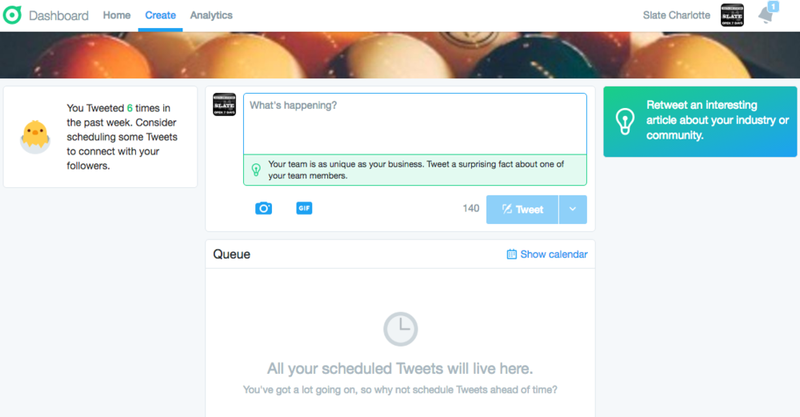 Twitter announced that Moments is now available for all users on their desktop platform. 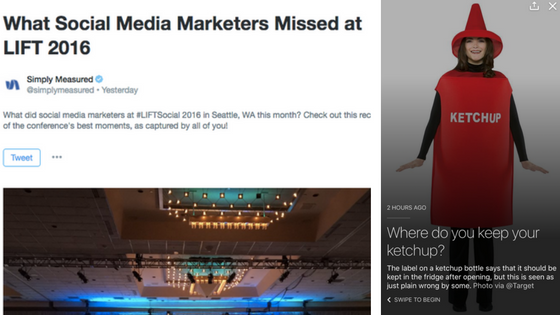 Following in the footsteps of Snapchat and now Instagram, Moments allows users to tell stories with tweets. Next, you'll click the icon near the upper-right side to create a new Moment. 2. Add the Title, Description, and Cover Photo for your Moment. In this section, you'll fill in a few things about your Moment. Twitter recommends users to keep the Title short, but descriptive and the Description should give people a "taste of what to expect in your moment." Note that the Title can be up to 75 characters in length and the Description up to 250 characters. Here, you will also add a cover photo using photos or videos from tweets, or upload one of your own. This is how your Moment will be displayed after you've filled out the information: Desktop pictured left, mobile on right. Once you have tweets in your collection, there's still time to edit, crop, and save your draft for later use. Ready to make your Moment live? Click on the Publish button at the top of the page. We hope you can find fun and creative ways to utilize Moment's for your brand! If you are using the new Instagram business profile, reviewing analytics can help you optimize your posts to increase your brand's visibility on user's feeds. With this quick guide, you'll get a better understanding of Insights and the metrics behind it. First, tap the Insights icon on the top right of your Instagram business profile. Here, you can find out what the new tools show you and the metrics that are important for any business. Want to know the best time to post content for the most engagement? Scroll down to the bottom of the Insights page, and tap See More in the Followers section. 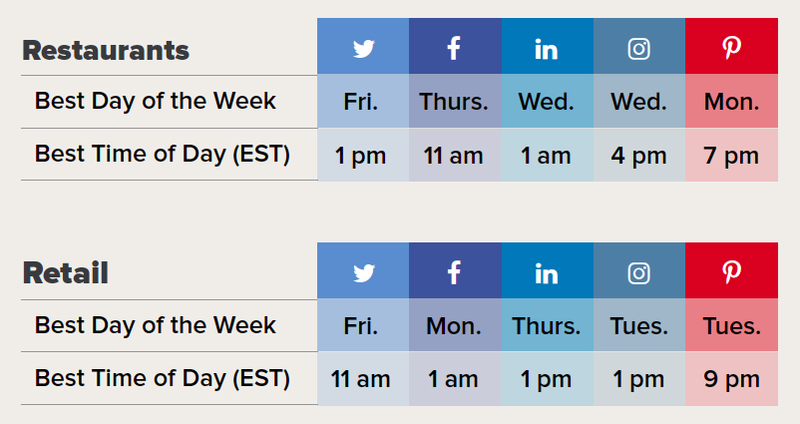 You can switch between views to show the most popular day and hours of the week that your audience is most active. View the age and the gender of people who viewed your choice. You can separate these demographics by location (cities/countries) to find out where your audience is from. Business profile users can break down how many users interacted with a post by day, by week, and by month. You can choose the chart to show you Impressions, Reach, Likes, Comments, etc. At the top of the Insights page, you can swipe left to see important characteristics about the activity your followers. Total Impressions - This will show you the total number of times all of your posts have been seen within a certain time frame. Reach - Based on the time frame you set, you can see the number of unique accounts that have seen any of your posts. Profile Views - Find out the number of times someone has viewed your profile. Website Clicks - Your website is in your profile for a reason. Check to see how many people clicked your website link. For users that are using Instagram business pages, Insights is an easy and extremely accessible way for people to view analytics and see how they can optimize their posting strategy. Have questions about setting up a business page? Shoot us an email! We're here to help! Is your business social-ready? We all know that social media can impact business growth, but how do we know which platform will perform best with our marketing strategy? Not only is social media an incredibly effective tool to connect your business with potential consumers, it's cost-effective and a great way to bolster your presence online. If you're a business owner and new to social media, here are a few things you want to ask yourself to help determine which network to choose for your marketing efforts. Choosing which social network to use depends on what goals you're trying to accomplish. Do you want to spread the news about your business? Are you selling a product? Promoting an event? These are some questions you want to answer to make it easier to separate each platform. People hang out on various social media networks for many different reasons. It's important to know which social media channels your target audience are using. This way, you can invest your resources more wisely and possibly reach a target audience with relatively smaller platforms, which can be cheaper and less time consuming. An effective way to do this is to research your competitor's audience and look at where they invest their resources online. What channels are they on? Which platform are they getting the most engagement? Another example is to ask them yourself. Send out an email to your customers and ask them where they spend most of their time on social media. Which Social Media Network Makes The Most Sense For my Business? When you've accurately answered these questions, it's on to the fun part. Here is a small guideline to a few of the most popular networks. The most popular network with the largest amount of active users (1.15 billion at that). If you want to reach a broad and diverse demographic, Facebook is a must. You'll need to set up a business page to begin acclimating yourself with different tools and strategies for Facebook marketing success. This will give you the ability to create ads, events, and content for your target audience. People come to Twitter to discover what's happening in the world right now. It's is one of the best platforms to share content instantly and to connect with people and businesses across a broad spectrum. Twitter makes it easy to discover conversations related to your business, helping you build meaningful connections with new and existing customers. For a younger, trendier audience, Instagram offers a way to reach this demographic with a visually appealing design. It's best used for high-end products or services, food/lifestyle/fashion themes, and for popular personalities. These two networks are extremely useful for businesses (especially B2B service providers). Both have more of a 'professional' focus on content and design. On LinkedIn, your network of connections (employees and contacts) is the most important content. There's nowhere better for a company seeking clients and individuals seeking employment. For Google+, keywords and search engine optimization are central to its appeal to businesses. It's a bit more formal and professional than Facebook, but both share some similarities. Now's the time to show off your goods online. No matter the business, social media needs to be a priority in any marketing strategy because of its multi-purpose use and ability to reach a target audience pertinent to your business. If you're having trouble deciding on which platform to use, try experimenting with all of them. It can't hurt to familiarize yourself with each network to help you choose the best option for maximum benefits. With Slideshow, advertisers can create a video-like ad by merging 3 to 7 still images that can be from existing video or photos, and stock images from Facebook's library. You can add audio and text overlay to bring your stories to life and send a message to your audience. If you are familiar with Facebook ads, you can quickly create a Slideshow through the Facebook Ad Campaign. 1. First, choose your objective. You can add a Slideshow to any objective that supports video. 2. After choosing your objective, choose the Page you will be promoting and add the necessary information specific to your ad campaign (targeting, budget, scheduling). 3. In the Video section, choose the Create Slideshow option and add up to 3-7 images to your slideshow ad. Images can be uploaded from your computer/mobile device or added from your page and Facebook stock photos. 4. You can add free audio tracks to play during the Slideshow and add text with different fonts and colors. 5. Set a total length of your Slideshow up to 35 seconds. 6. Click Create Slideshow again to finalize your video. Then, choose the thumbnail of your video ad and enter the text and any call to action buttons you want to show. According to Facebook, users are watching at least 1 video during their time on the platform. And as more people around the world gain access social media, it's important that different variables are taken into account. Slideshow uses less data and loads faster than the average video ad, making it more accessible for users on 2G or 3G connections. Facebook has demonstrated that a 15-second Slideshow results in a file size one-fifth the size of a video the same length. This is ideal for reaching new users no matter the device, connection, and location. Last year, Coca-Cola ran a brief campaign in Kenya and Nigeria using Slideshows to raise awareness for its Coke Studio Africa Project. Their goal? Reach consumers with slower connection speeds and older technology. Their Slideshow Ad reached 2 million consumers. Stance, a high-fashion sock company, used Facebook Slideshow to grab the attention of potential consumers. Instead of spending resources on new photos, they took existing still images from their online product catalog and created slideshow ads. The strategy proved to be a success, as the company increased their CTR by 2.4x, lowered their CPA by 48%, and saw a 1.4x boost in return on ad spend. Photos of your products, services, curated content, and behind-the-scenes looks can determine how much your ad stands out on news feeds. It's important that you track what actions consumers take after clicking your ads, whether it's purchasing a product, visiting your website or signing up for an email list. 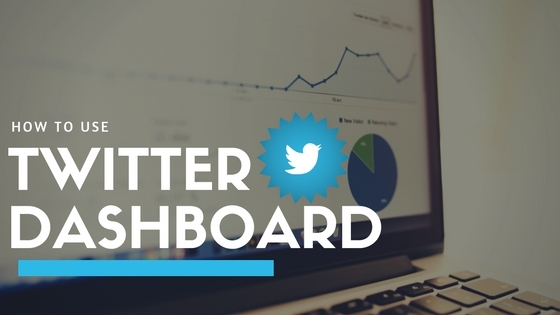 Monitoring this can help you optimize your campaigns to reach your goals. Now's the time to strategize with video-like content within your social media campaigns. For businesses with limited resources, tools like Facebook Slideshows have shown that you don't have to be an expert to create engaging and exciting content. Have you used Slideshow in your Facebook Ads? Did you see a difference in performance compared to a still image ad? Time flies when you're having fun (and working hard of course). With the continued support from our awesome clients, beloved friends, family, and all of our fans, we're cruising through the 2016 calendar and can't wait to see what lies ahead. This past August marked Social Ape's 4 year anniversary. What better way to celebrate this tremendous achievement than with great beer and food at VBGB Beer Hall & Garden! Like in recent past, we asked people to bring school supplies to Classroom Central, a local charity that donates supplies to underprivileged children in the community. A few local Charlotte businesses were gracious enough to donate gift baskets, swag and other great prizes to be raffled off to those in attendance. Utmost thanks to The Olde Mecklenburg Brewery, Rich & Bennett, Roaring Riot, and New Leaf Construction for providing us with everything! It's not a party without a photo booth. We had a BLAST with everyone at our 4 year anniversary celebration and can only hope we can continue building on this success for years to come. It all comes a little easier when you have the support and love from our Social Ape family! Thanks again for joining us. First impressions come in many forms these days and a lot of times, it's through social media. Facebook now has over 1.13 billion daily active users. As marketers, we know that consumers are becoming more accustomed to using Facebook for finding information about a business and less likely to visit a website or make a phone call. Most of the actual content has remained the same from the old layout, just positioned in a new area. Before the changes, content was cluttered and disorganized, now it appears more spacious. Your profile pictures now appear at the top left of your page in a new navigation column. They will no longer overshadow your cover photo, where it was earlier, a bit distracting and cluttered. The minimum size remains unchanged at 180 x 180 pixels. The Facebook layout change makes your cover photo the center of attention. It has been repositioned to the right and is free of any overlap (profile picture, business name). The image size also remains the same at 828 x 315 pixels. In the past, you may have created an image that made your profile picture more visible, so be sure to edit that if necessary. Below your cover photo you'll now find a new prominent blue CTA button. Previously, Call-to-Action buttons, Like and Share buttons were cluttered on the cover photo. You can create different CTA buttons for desktop and mobile, whether it's to invite your followers to your website, direct phone calls or for shopping. When you're on a Facebook Business page, you'll notice as your scrolling through that the left sidebar remains stationary. This is to make it easier for users to click on tabs that were mostly hidden in the old layout. Previously, only 4 tabs were visible for visitors and a 'More' section contained the rest. With the new design, you can add more custom tabs that will appear on the stationary sidebar and drive more traffic to other content. Overall, the new design of Facebook Business pages makes for a more aesthetically pleasing look and easier navigation. And CTA buttons are bold and more visible, which can lead to engagement in more of your content. First impressions mean everything for a business, and nowadays it may come from how professional your social media campaigns appear. The moment you step into the world of Snapchat it's as if life becomes a little more exciting. Snapchat is fun, spontaneous, and innovative in the way we communicate with our audience. With its rising success, the mobile app recently passed Twitter in terms of daily active users. That's more than a reason why to start using Snapchat if you haven't already. This is where the fun starts. Snapchat filters are accessed by swiping left and right on an image or video to enhance the snaps you are sending. Maybe you want to share a video of how fast you're driving with the MPH filter, but you want it in black and white. Thanks to this simple trick, you can use both. Choose which filter you want to use first, then hold one finger down on the screen and swipe left or right for the second layer. This Snapchat feature allows you to attach --or "pin"-- emojis and stickers to different objects in your videos. The emojis automatically move, rotate, and scale with the object you pinned it to. To do this, record your video first and tap the folded paper icon on the top of your screen. Next, choose your emoji or sticker and hold it in one place above the object to pin it. The Snapchat drawing tool doesn't offer black and white on its color palette. To access the 'available' colors, hold your finger down on the palette and drag it towards the upper left corner to draw in white, or the bottom right for black. Also, you'll notice that while you drag to the corners, the original color palette's on the scale will lighten for even more variety. Ever wonder what the icons next to someone's name indicated? Well, there's a list of every emoji and their meanings. Go to your Settings, scroll down to Manage, and press Friend Emojis. These details will tell you how you're spreading the Snapchat love. Before you can call yourself a Snapchat pro, these are some of the hidden --and newly added-- features that can enhance your content and up your Snapchat game for better engagement. Have more tricks or tips that weren't mentioned here? We'd love to know! Send us a tweet @SocialApeMktg or just reply to this email. We're Hiring a Fall Intern! Social Ape Marketing is a forward-thinking marketing company that produces creative digital content for clients on a daily basis. We seek to hire a talented intern who has the desire to learn and work in a high paced, fun environment. Our ideal candidate is enthusiastic, passionate about social media and public relations, and dedicated to growing the Social Ape. The internship will begin in September. Please email your resume to April Smith at April@socialapemarketing.com with “Social Ape Fall Internship” in the subject line.